Cyprus has the habit of grabbing international attention in a global way, only to then be marginalised as a footnote when the immediate crisis seems to have abated. This has been historically true in issues of communal violence and the Annan plan, in what we Cypriots call “the original Cyprus problem”. Sadly for Cyprus, this is also seems to hold true in regards to its financial crisis. After the March 2013 bailout and the partial bail-in of uninsured deposits in some Cypriot banks, the international attention has moved away from the island. Yet despite the lack of interest internationally, troubles that need international cooperation for resolution remain. Unless more attention is given by the international community in 2014, both the Cyprus problem and the financial crisis are in danger of becoming intractable impediments against Cypriot recovery. The negotiations of the Cyprus question seem to have hit a snag even before they began. Despite a resurgence of optimism during the summer over a possible breakthrough confidence building measures, which could have included the return of the abandoned city of Varosha and the partial lifting of trade and flight embargoes, the mood has significantly soured since. This breakdown is mostly due to Turkish Cypriot community leader Dervis Eroglu rejecting the use of binding phraseology on sovereignty and nationality in the communique that would launch the new round of negotiations, and the reluctance of the Greek Cypriot government in being bound to a tight deadline for talks that might lead to the strengthening of calls for “normalization” of the EU relationship with the unrecognized TRNC. The actual timeframe before major elections in capitals that matter is tightening, and thus unless a common communique is agreed upon soon the opportunity to conclude negotiations in 2014 might be lost. The government of Cyprus has requested that the EU adopt a far more active role in the negotiation process: its aim was not to undermine the role of the United Nations in leading the efforts for a settlement, but to introduce the EU as a neutral arbitrator where basic premises of the European acquis communitaire are threatened. Proposals and solution plans in the past have ignored the non-compatibility with the basic laws and regulations of the EU, and thus the Republic of Cyprus suggested empowering the EU’s role in the negotiations in order to unlock thorny issues in 2014. It must be said that looking at it from Cyprus it seems the EU is currently reluctant to take on this more active role. Despite the aura of pessimism around the possibility of starting negotiations, the Republic of Cyprus has established working groups on six major issues to support the negotiator in the upcoming negotiations. The ruling system in Cyprus is supremely centred on the President, currently Nicos Anastasiades, who is elected directly by the electorate; thus one must feel great sympathy for the President that has to manage the Cyprus problem while the nation is in the grip of its worst financial crisis. The Cypriot financial crisis is particularly severe due to the delay of taking action from the previous president, Demetris Christofias: Cyprus refused to capitulate to market sentiment for a long time after Greece, Ireland, Portugal and Spain concluded bailout negotiations. 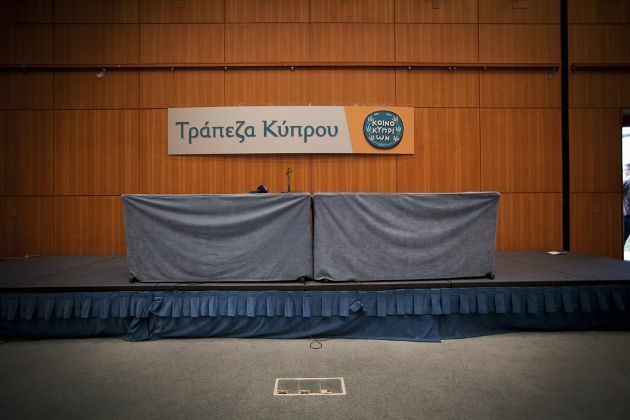 The added delay magnified Cypriot banking problems, compounding the problems of Laiki and Bank of Cyprus from non-performing loans in Greece and the severe losses that they were inflicted due to the haircut, or PSI, of Greek government bonds. The bail-in of the uninsured depositors of Laiki Bank and its merger with Bank of Cyprus (whose uninsured depositors were also partially bailed-in) is generally understood as being a badly botched affair, despite European protestations to the contrary. The Cyprus financial system is still in the emergency room: capital controls are still in place and there is an excessive reliance on the European Central Bank’s Emergency Liquidity Assistance (ELA) due to the decision to sell the assets of all Cypriot banks in Greece. The poor return of this sale resulted in Bank of Cyprus having to pledge its own assets for ELA that Laiki provided to its branches in Greece, leading to a precarious liquidity situation for the new, hugely systemic, Bank of Cyprus. The financial system cannot recover in Cyprus unless the ECB allows for the ELA to be replaced by more long-term finance; however there seems to be a lack of interest for such accommodation in this stage. Trust cannot be regained in the Cypriot banking system in 2014 if the bank that holds more than 50 percent of loans and deposits is severely exposed to ELA obligations. Most analysts seem to be optimistic about Cyprus due to the better than expected 2013 results, were GDP is expected to fall -5.5 to -6.5 percent rather than the expected -8.7 percent of the troika estimate in March. The October business survey also showed a slight increase in sentiment that seems to back up the optimistic view. Yet, economists remain very pessimistic: the latest projections by the University of Cyprus indicate a -8 percent decline in 2014. The lack of liquidity will result in banks making an intense effort to recover assets in 2014, leading to a much more severe recession than predicted by the memorandum. In the upcoming year the efforts to recover value from non-performing loans will lead to intense political pressure to exclude groups. Already a law that would require a reduction of business loan interest rates has passed but its implementation is delayed through legal processes by the President as the “request” of the troika. However the very high levels of debt of companies and households in Cyprus will result in very severe reduction on consumption in 2014 as well as a possible new risk to the banking system through a dramatic increase of non-performing loans.